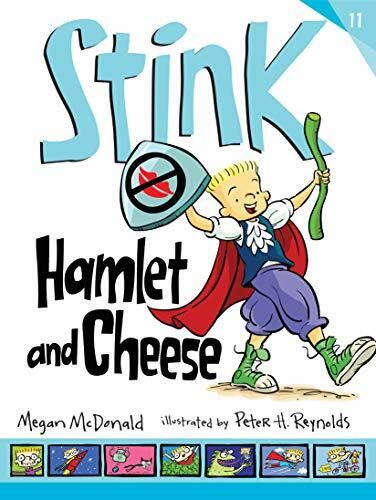 In the latest entry of this charming chapter book series, the lovably clueless Stink Moody gets an education in all things Shakespearean. At the start, he thinks that “William Shakesbeard” is “that 400-year-old guy who wrote all those plays,” and believes that a Shakespearean sprite is a soft drink. But thanks to his friend Sophie, Stink soon finds himself attending Shakespeare Sprites Camp with her during spring break. As the group members spend the week preparing their scenes, they delve into Shakespeare and his plays, practice tongue twisters like, “Fat frogs fly past fast,” and learn stage-fighting techniques. They even witness a college production of Macbeth, from which Stink must extract his Grandma Lou’s inquisitive dog Pugsy. But as show time approaches for the Shakespeare Sprites, Stink finds himself more and more worried about Riley and her smooches. As she puts it, “There’s a lot of kissing in Shakespeare.” Big sister Judy Moody makes Stink a “smooch shield” to protect him, but will it be enough to save him, come curtain time? Frequent illustrations by Peter H. Reynolds up the fun quotient, as do the occasional pages of Shakespearean quotes, insults, and coined words. Forsooth, methinks this chapter book is a winner!